Isaac Bashevis Singer, the Polish-born Yiddish writer and Nobel laureate, and New York documentary photographer Bruce Davidson collaborated on a surreal feature film made in 1973, entitled Isaac Bashevis Singer’s Nightmare and Mrs. Pupko’s Beard. This film was at once a documentary about Singer’s New York and a dramatization of one his short stories. The film grew out of their friendship, as residents of the same building on the upper West Side of Manhattan, and their common interest in New York City street life. During and after production, Davidson made numerous portraits of Singer and also returned to the Lower East Side for a documentary series of photographs. 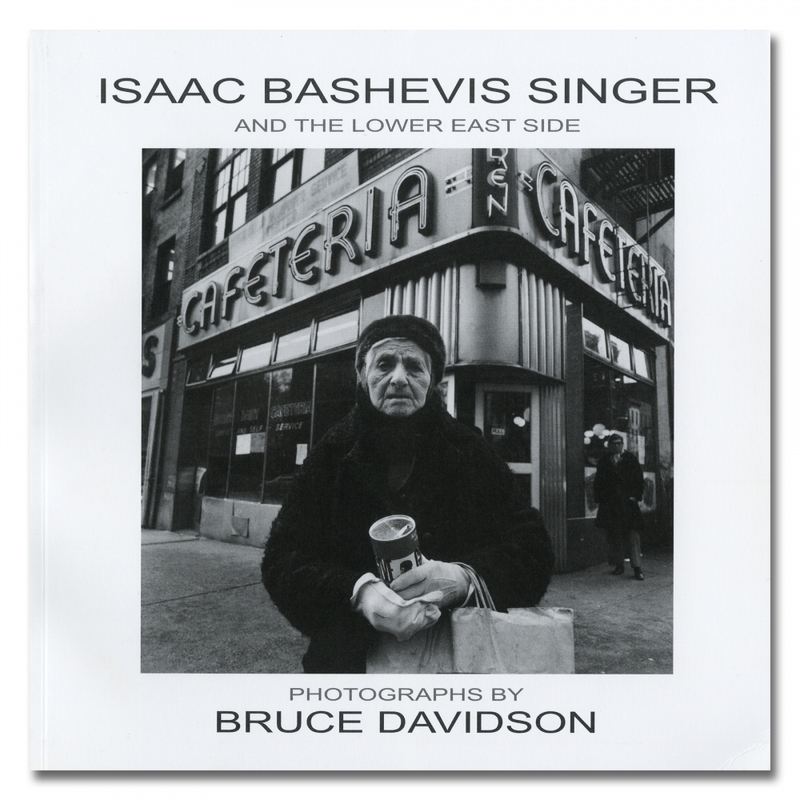 A selection of more than forty of the stunning images made between 1957 and 1990 is available here for the first time in Isaac Bashevis Singer and the Lower East Side: Photographs by Bruce Davidson. The book also includes portraits of Singer, stills from the film, the black and white portfolio known as The Garden Cafeteria, and selections from the Lower East Side series. The Garden Cafeteria was a collaboration depicting denizens of the East Broadway restaurant frequented by Singer during his trips to The Jewish Daily Forward. The portfolio has never been published nor exhibited in its entirety—until this volume. Included is an introduction by Singer himself on Davidson’s images, an in-depth interview with Davidson about his art, aesthetic and political views, and his Jewishness, and a reflective, contextual essay by Ilan Stavans on the relevance of this collaboration between the writer and the photographer. Through Davidson’s lens we see Singer’s literary world of Holocaust survivors and émigrés from Eastern Europe—a displaced culture in its twilight. This book is a co-publication and appears in conjunction with an exhibition organized and presented by the Mead Art Museum at Amherst College, on the occasion of the centennial celebration nationwide of Singer's birth in 2004.